SNAFU! 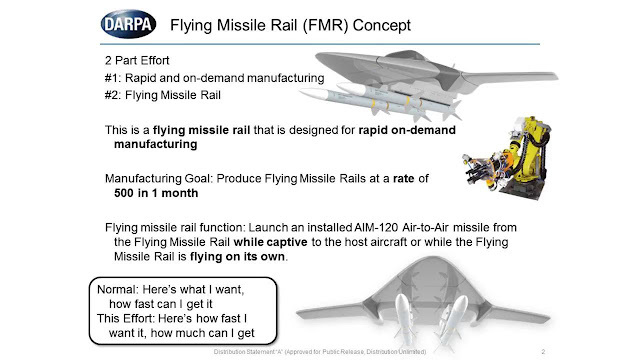 : DARPA’s Flying Missile Rail via Alert 5. DARPA’s Flying Missile Rail via Alert 5. Geez! Someone at DARPA is on crack! A flying missile rail? That can be carried by an F-16 or F-18? If deployed from those aircraft can move out at .9 Mach? Check out the vid below. I'm not an engineer but this sounds like they're asking for the impossible. How do you build a vehicle that is light enough to be carried by a fighter, fast enough to zoom away by itself at .9 Mach, and carry at least one long range air to air missile? On top of that they're not asking for a dedicated program but asking for rapid manufacturing of the item. On top of all that they're offering pennies on the dollar for all the brainwork involved. Yep. DARPA needs to be ground zero for enhanced drug testing.